An air conditioning unit is essential to the comfort and health of Houston household. However, you should always be extra careful about your AC during the summer. This is a period when the unit is to undergoing rigorous use of a long period. This strain on your air conditioner might lead to new problems or exacerbate old ones that would have remained hidden. The best way to recognize issues with your unit is by taking note of the incoherent noises as it’s running. Here are 5 air conditioner noises to make you get worried. Running your air conditioner after a long period without the use of for an extended period might make the unit to begin squealing and squeaking. This noise might come from the area near the indoor air handler. The noise happens because the bearing in the fan blower motor is dried up from the excessive operation. Increased friction between the balls is what results in these annoying sounds. Ensure to call a technician to fix the issues before it escalates. Do you hear a hissing noise from your AC unit? This is proof that there’s accumulation of air bubble in the refrigerant line. It happens when the refrigerant leaks. This makes your unit to require more refrigerant than usual to replace that, which has leaked. A drop in the refrigerant level after a leakage significantly affects cooling efficiency. A professional AC technician will come in handy to fix the leak and enhance cooling efficiency of your unit. As soon as you hear your air conditioner making high pitched screams, turn it off and call professional Houston AC contractors immediately. The sound might be resulting from leaking refrigerant. This might damage the unit and threaten the health of your family. The screams indicate dangerous high internal pressure in the compressor. Sometimes the issue might make the air conditioner to turn off on its own. The sensor on the unit might have triggered the turnoff to protect your family from a potentially hazardous condition. This usually comes from the vents. Ductworks are from metal sheets that expand and contract due to changes in temperature. During cycling off, change in temperature causes expansion and contraction. 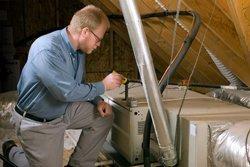 This process causes muffling sounds that a professional AC technician can fix right away. When the AC turns on and off frequently, it leads to short cycling noises. This condition is caused by internal issues from your electrical connection. Short cycling compromises cooling and wear out your air conditioner with recurrent switching on and off. Ensure to call a professional air conditioner technician to repair your system before its lifespan is shortened. A working air conditioner is essential for the comfort of your home. it lessens sweaty moments in the summer and promotes healthier living. Therefore, ensure to pay special attention to the various noises that might be coming from your unit. These will arrive promptly to diagnose issues with your unit and fix the problem before things get out of hand.